Nancy M. West: President Obama Herds Flock of Cats? President Obama Herds Flock of Cats? 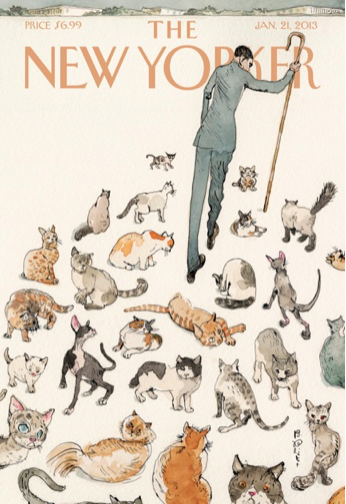 According to the cover of this week's The New Yorker, President Obama is a lone shepherd herding a flock of unruly cats...uh...or is that the 113th United States Congress? It's a cute Inauguration cover, especially for the cat lovers among us, and the President does cut a striking figure with his biblical-like staff, but I take exception to clever and resourceful cats being compared to a lack-luster House of Representatives. Then again, we all know it's impossible to get cats to do what you want them to do. Perhaps a little catnip in their tea, Mr. President?